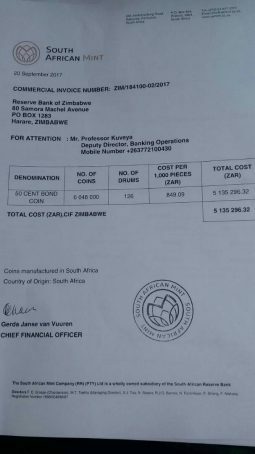 The Reserve Bank of Zimbabwe ordered 6,048,000 bond coins worth $3,024,000 from the South African Mint company. 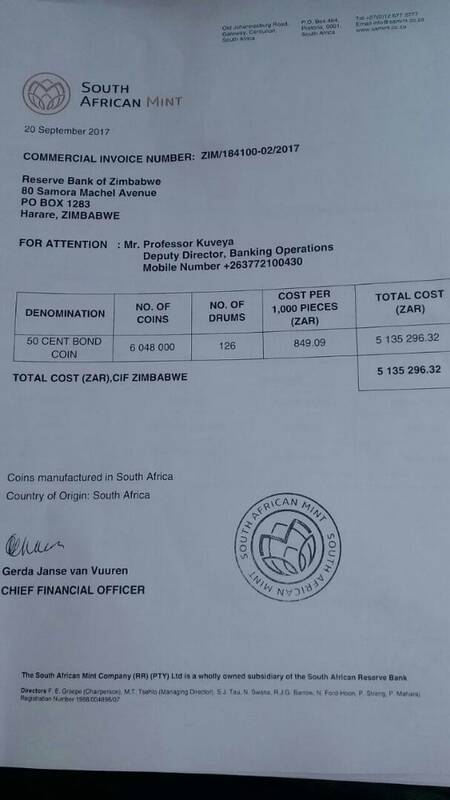 The bond coins ordered are in the 50c denomination and will be enough to fill 126 drums. This information was obtained from a leaked invoice. The invoice is addressed to the Reserve Bank of Zimbabwe by South African Mint company. The same company which manufactures coins for the South African Reserve Bank. The charge on the invoice is R5,135,296.32 which comes out to about $384,615 if an exchange rate of USD1 : R13.35 is used. The bond coins are meant to ease the cash shortages in the country but seeing as they have failed so far we will not be holding our breaths. This batch on its own is not a big deal but the question becomes how many such batches are being ordered and how frequently? The other question is why are the coins being manufactured in South Africa? That is $384,000 being externalised right there. Is there no company that can manufacture those coins in this country? If there isn’t, which might very well be the case, how did we get to that. What is being done to increase production in this country? What do you think about all this. How to send money from Zimbabwe to South Africa? Hey I want to invest on the capital markets, who do I talk to? @Garry, I share the same view as you! Dankie! Not that I have ever supported the introductions of the bond notes/coins but perhaps this will deter ppl from continuing their illicit forex trading actvities at Eastgate. They should bring at least 126 drums in order to do their transactions in COINS. Mangudya didn’t think quickly in the first place, methinks. I do hope of course that the Governor and or his subordinates see this comment and act accordingly in the future. The unverfied invoice states 126 drums not 26, by the way. And, even if it is legit, it is not externalisation, because they are actually paying for something. The 5m ZAR now belongs to the minting company not the RBZ. Bond coins are not being minted locally to allow for “transparency” in the production process. If they were locally produced, then government could produce them at will, in unregulated quantities. Not that it’s impossible with a foreign minting company. Why Bond Coins and not Bond Notes? Because Bond Notes are numbered and can be tracked and traced. Bond coins on the other hand are not numbered and not tracked or traced. So mint as many as you like and put them into the non-economy. We are already awash with coins. Just wait now for many, many more. Coins are exactly what we need since plastic money is not yet useful for small transactions.